February 17, 2017: Once again the Plaintiffs in our federal civil rights lawsuit against New York City and District Attorney Cyrus Vance, Jr., have filed a Notice of Appeal following U.S. District Court Judge Katherine B. Forrest's tortured 35-page decision in the case. In the prior appeal of Judge Forrest's initial outrageous dismissal of the case, the Court of Appeals for the Second Circuit ruled unanimously in favor of the Plaintiffs. That led to a trial on the merits and the outrageous decision being appealed this time around. 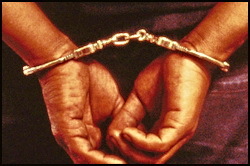 In her decision, Judge Forrest fundamentally re-characterized the case in a way that did not reflect the case presented. The Court disregarded key evidence and ignored the basic argument in the lawsuit that a person has no way of knowing if he possesses a knife that could result in arrest and prosecution. That is the central issue in Plaintiff's constitutional Void for Vagueness claim. Assistant DA Dan Rather, Jr. even admitted at trial that a knife that cannot be "flicked" open by the purchaser at the time of lawful purchase can suddenly transform into an illegal gravity knife two steps out the door if an NYPD officer is able to "flick" it open. Despite that damning testimony that proves that the City's so-called "wrist flick" test is subjective, variable, and thus unconstitutionally vague, as well as all the other evidence presented by the Plaintiffs in the case, the Court avoided dealing with this key point by essentially ignoring Plaintiff's claim. Instead, the Court bought into the City's and DA's egregious argument that the claim that the Plaintiffs could not purchase another knife without risking arrest again was hypothetical, when it is not at all. It is a real risk that the Plaintiffs face, as well as anyone else, in buying or carrying a common folding knife in New York City. Knife Rights' Gravity Knife Reform Bill was introduced earlier this week in an effort to solve legislatively the problem of the continuing arrests and prosecutions on bogus Gravity Knife charges in New York City. Governor Cuomo vetoed last year's bill, which had passed the legislature overwhelmingly, on New Year's Eve. Click on Read More >>>> for additional details. 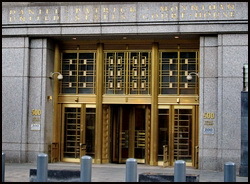 Last Friday U.S. District Court Judge Katherine B. Forrest ruled in favor of New York City and District Attorney Cyrus Vance, Jr. in Knife Rights' long-running federal civil rights case challenging the City's policy of treating any locking blade folding knife that can be "flicked" open as a prohibited gravity knife. In a tortured 35-page decision, the Court fundamentally re-characterized the case in a way that did not reflect the case presented. The Court disregarded key evidence and ignored the basic argument in the lawsuit that a person has no way of knowing if he possesses a knife that could result in arrest and prosecution. That is the central issue in Plaintiff's constitutional Void for Vagueness claim. Assistant DA Dan Rather, Jr. even admitted at trial that a knife that cannot be "flicked" open by the purchaser at the time of lawful purchase can suddenly transform into an illegal gravity knife two steps out the door if an NYPD officer is able to "flick" it open. Plaintiffs will appeal this decision that upholds an unconstitutional policy. Knife Rights' fight against New York City's assault on pocket knife owners and our constitutionally protected rights continues. We are fighting the largest city in America and an injustice that strikes at the heart of our freedoms on many levels. The City and DA Vance have virtually unlimited taxpayer funding to oppose us; we need your support to stay in this fight and prevail in the end. Please support this lawsuit with a TAX-DEDUCTIBLE charitable contribution to the Knife Rights Foundation. It is not uncommon for lower courts, especially in the Northeast, to uphold questionable and constitutionally problematic laws involving knives and firearms. As such, it is not all that surprising that the Court delivered this decision. The real battle almost always takes place in the appellate courts, which is where this case is headed now, and always was, regardless of this lower court's decision. Until Plaintiffs win on appeal, those living in or visiting New York City and carrying common folding knives with a locking blade will continue to be needlessly harassed, imprisoned and prosecuted by the City's "stop and flick" follow-up to the infamous "stop and frisk" policy previously ruled unconstitutional. All but a handful of those trumpeted stop and frisk "illegal weapon" arrests and seizures involved these same common folding knives carried and used by millions of Americans everyday at home, work and while recreating. Research by the Legal Aid Society and The Village Voice concluded that over 85% of the over 60,000 persons that are estimated to have been arrested and prosecuted for carrying these common folding knives in the past 12 years are minorities -- a glaringly discriminatory arrest policy. Even New York's Governor, while recently vetoing for his own politically-inspired motivations Knife Rights' legislation that passed overwhelmingly, and which would have resolved this issue, called these arrests "absurd." Knife Rights Chairman Doug Ritter said, "we knew when we started this lawsuit that it would be a long road to justice and we are prepared to see it through. We will carry on seeking justice and the restoration of sanity to New York knife law and we are looking forward to presenting the appeal before the Second Circuit." The lawsuit challenges New York City's and District Attorney Vance's attempt to criminalize as contraband the most widely-owned pocket knives in America -- locking blade folding knives -- under state law prohibiting gravity knives. The case seeks a judicial determination that the New York State law regarding gravity knives is unconstitutionally vague as applied by NYC and the DA to these common folding knives (which are distinct from gravity knives because of their bias towards closure). Knife Rights' lawsuit intends to stop NYC law enforcement and officials from abusing this unconstitutionally vague state law to make bogus arrests of law-abiding citizens carrying common pocket knives, and from coercing knife retailers into making huge payments to avoid prosecution. Meanwhile, Knife Rights and the broad coalition of organizations opposing the City's gravity knife policy continue to work with New York Assemblyman Dan Quart and Senator Diane Savino on a legislative solution to the problem. Look for a new bill to be filed shortly. WARNING: New York City has interpreted the state law against gravity knives such that if an officer can "wrist flick" the knife blade open, or alleges that the knife might be able to be opened in such a manner, and the knife blade locks open, that knife is an illegal gravity knife, even if you cannot do so. NYC takes this position even if it requires multiple tries and use of exaggerated arm thrust or motion. Using this interpretation, most any locking blade folding knife might be deemed an illegal gravity knife. Note also that New York City administrative code has an under-4-inch blade length limit and requires knives be carried FULLY concealed. Knife Rights suggests that you never carry your knife clipped to your pocket in New York City as it is illegally "not concealed" and will likely result in a stop by NYPD, resulting in a violation or arrest. Even when covered by a jacket, simply moving the jacket aside to get to a wallet has been enough to get folks a violation or arrested. 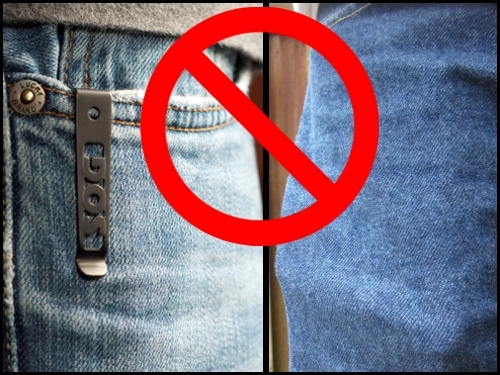 Always ensure your knife is completely concealed at all times, including not "printing" on the outside of your clothing. In addition, be extremely circumspect about using a knife for any purpose in a public setting.